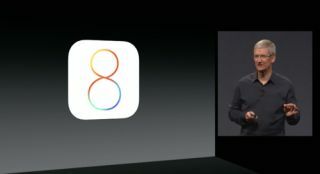 Apple launches iOS 8 at WWDC | What Hi-Fi? Apple has officially announced iOS 8 at WWDC, the latest version of the company's operating software for iPhone, iPad and iPod Touch. iOS 8 will be released this Autumn. Promising a faster, more intuitive user experience, key features include improved sharing and syncing of content across iOS devices, updates to the Messages and Photos apps, and complete new apps for Health (HealthKit) and Smart Home (SmartKit) control. Also new on iOS 8 are 'interactive notifications', a new sidebar and bird's eye view of tabs, plus updates to Mail, Safari and Spotlight search. Craig Federighi, Apple’s senior vice president of Software Engineering, said: "iOS 8 offers simpler, faster and more intuitive ways to use your device with incredible new features like iCloud Photo Library, a new Messages app, the QuickType keyboard and an entirely new Health app." Apple aims to improve predictive text, taking word suggestion to context – not just correcting typos – with Apple saying "we'll all be typing faster now". Also new is the ability to sync texts and calls across Apple devices, from iPhone to iPad to Mac, with iOS 8 and the new OS X Yosemite working together to sync messages and allow users to make and take calls via your iPhone using your Mac. Family sharing allows you to set parental controls so any app purchases on one device can be monitored on another, thanks to an automatic alert. Updates to the Messages app will bring group messaging, and the ability to send audio and video, in something of a swipe at messaging behemoth WhatsApp. As widely predicted, Apple also revealed HealthKit and a new Health app, which will work with fitness apps, such as Nike+, to analyse weight, diet, blood pressure and more. Apple HomeKit was also unveiled, aiming to turn your iPhone in to a one-stop remote for all your home automation devices, from lighting to thermostats to automatic doors. Siri got some updates, too, with the ability to start Siri with just a voice command ("Hey, Siri! "), iTunes purchasing, Shazam integration and improved weather data. The Photos app also got an update, with new editing features, an improved search for finding your images and automatic cloud-sharing of images across devices using iCloud. Apple revealed it has now sold more than 800 million iOS devices, with over 100 million iPod Touch devices, 200 million iPads and 500 million iPhone units. 130 million people bought their first device in the last year, with 89% of iOS users now on iOS 7. The Apple App Store now has 1.2 million apps and 300 million weekly users who between them have downloaded over 75 billion apps to date. Apple also launched OS X Yosemite, the new Apple Mac software, bringing an iOS-style feel to the Apple desktop. OS X 10.10 has a new look, with new icons and toolbars, and the option of a 'dark mode'. Apple also redesigned Spotlight, the Mac search tool, and introduced iCloud Drive to sync files across devices much like Dropbox or Google Drive. Safari, Apple's web browser, was also refreshed with a new look and a host of changes, including new private browsing modes and HTML 5 support "for streaming Netflix". There was no new hardware, though many of the new developments and apps can certainly be seen to be paving the way for new products later this year. iOS 8 will be available this Autumn as a free software update for iPhone 4s, iPhone 5, iPhone 5c, iPhone 5s, iPod touch 5th generation, iPad 2, iPad with Retina display, iPad Air, iPad mini and iPad mini with Retina display.